Sir! Sir! 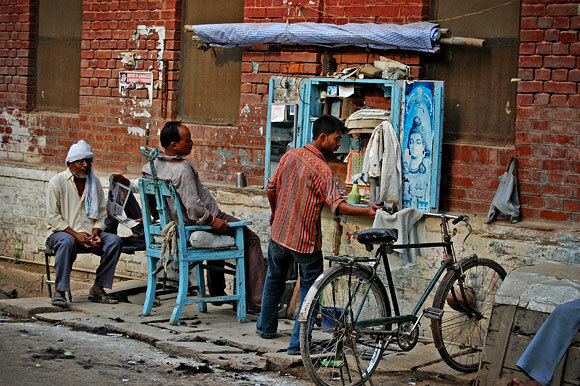 A Post On Touts and Varanasi, India. On Sunday, J. and I boarded an early flight to Delhi from the modest and militarized Leh Airport. After saying goodbye to our last majestic mountain view, the plane landed in smelly Delhi. 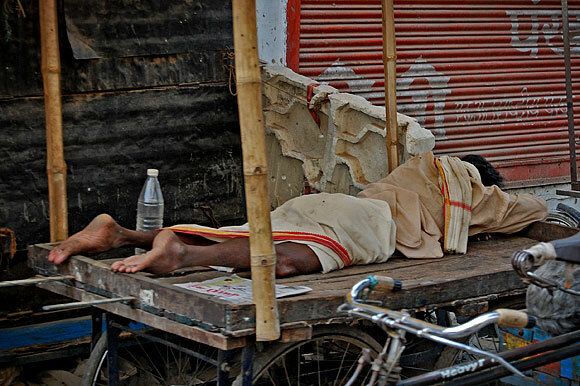 That evening, we were to board a sleeper train bound for Varanasi. 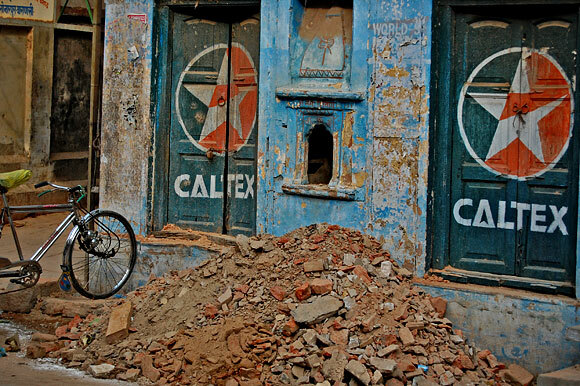 We headed by cab to the New Delhi train station to see if there was a place to leave our bags. But the train station was a sketchy madhouse, swarming with activity. J. asked a lady in the woman-only line what we needed to ride the train that evening. She explained, sort of. If was not long after talking to her that we experienced our first real scam. In front of the gates to the train platform, a man in professional clothes came up to us and asked to look at our tickets. He claimed we needed to get a boarding pass. We were skeptical. He explained that he was from the train company, showed us his credentials, and asked us to follow him to the reservation window. Except the reservation window was across the street in a small upstairs tourist office. We knew it was a scam mostly, but we walked with him just to see. Plus, who knew? The office was thick with cigarette smoke from a slick looking man behind a desk. All around were posters of India. The man gave a decent enough explanation of why our seats were not confirmed. I could tell that eventually it would lead to him suggesting we book different tickets. But we never bit the hook, and his story began to unravel. I motioned to J. that it was time to leave. As we walked out, the man told the truth. “Your seats are confirmed. Your seats are confirmed.” Well duh. Pleasure not doing business with you. 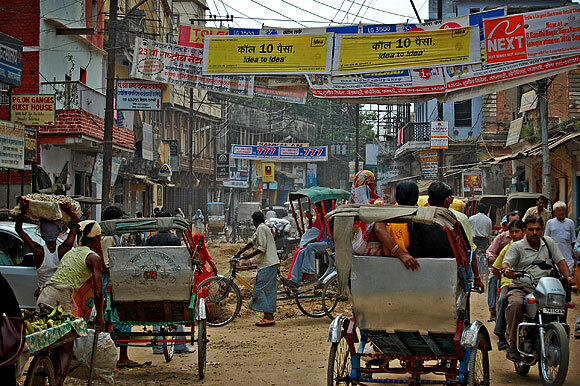 As tourists in India, we have been bombarded with all sorts of offers: massage, ganja, give money/candy, peddle cab, auto rickshaw, where you go, sari, silk, hungry, tour? The taxi drivers, even the better ones, have some hotel that pays them money if they get you to go there. It’s sad because while I’m sure the average Indian is a nice non-schemer, the constant hassling puts the foreigner on guard for everyone. J. and I booked a room for a day at a decent hotel near the station, rather than wander around Delhi sweating under the weight of our bags. We got to the station early and watched the swarms of people and trains; the people watched us. Out of hundreds of people, we seemed to be the only tourists. I guess the bomb blasts scared everyone away. It was good people watching. We weren’t really sure what platform or cabin our seats were in. The station was massive and filthy. 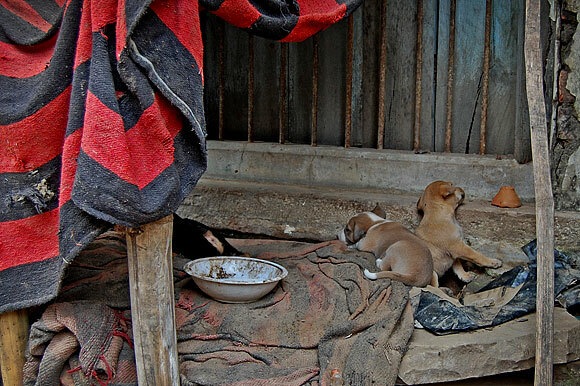 The train tracks were full of litter, human waste, spit, and hundreds of rats. Occasionally, the dirtiest looking person in the world would walk by on the tracks collecting plastic bottles and kicking rats away. Next to us was a water fountain that was bustling with people refilling plastic bottles, washing their faces, and drinking from the spigots. We ate some amazingly flavored Indian packaged snacks of the peanut and pulses variety. The train’s squat toilet drained through a hole directly onto the track rushing underneath. Luckily, we had a sleeper cabin to ourselves. It was Thai quality. We slept well through the night. 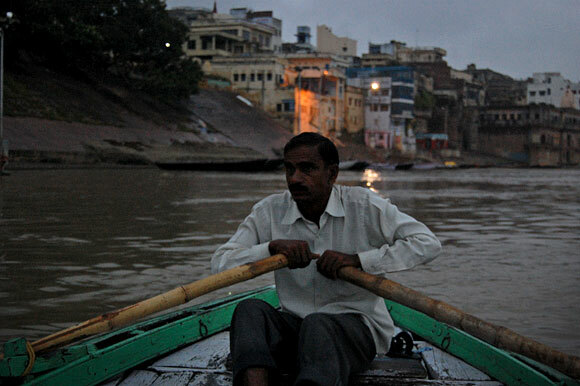 In the morning, we arrived in Varanasi. 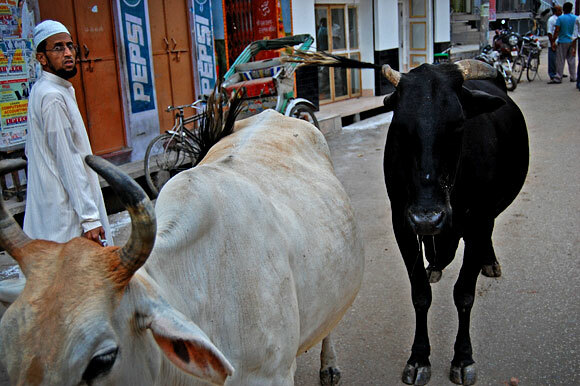 The Varanasi train station was small and it had a large cow that was wandering around the covered platform knocking over trash cans. It was unclear where to book a taxi, but another huckster was “kind” enough to show us. We bought a prepaid ticket and went to our cab. He got in too, a sure sign that he was touting something. The man was pleasant enough, but his conversation was eventually leading to showing us a hotel. I said no. We talked some more. He suggested again to just take a look at so and so hotel. I told him, NO we already had a reservation. That seemed to shut him up. He got out of the cab in the middle of the street and told the driver to take us where we had told them to go in the first place. Stupid idiot. The driver himself was actually quiet and nice and showed us where our guesthouse was. We would have had a hard time finding it otherwise. I did not tip him however. I should have explained why. Our guesthouse is an oasis here. 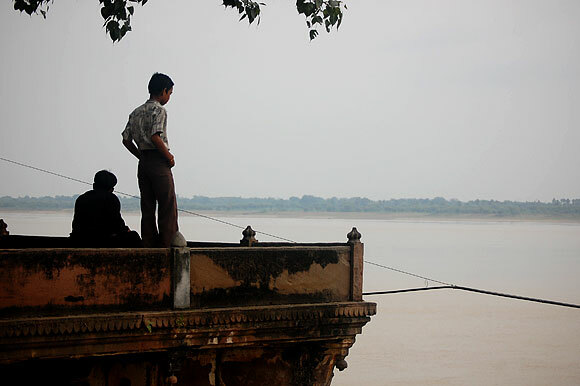 It’s called Sahi River View, and has open air balconies with view of the less busy section of Assi Ghat. Our fan room has hot water and runs for 350Rs($8) a night. 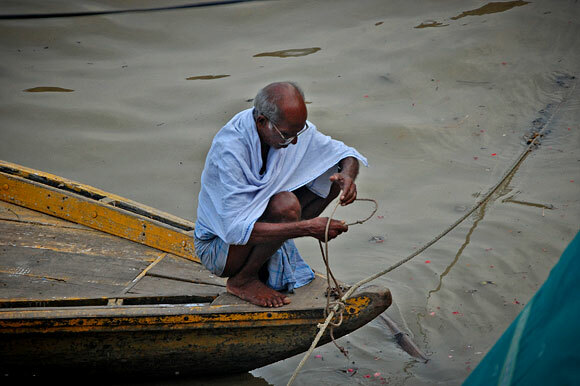 Looking out over the Ganges while drinking from a small pot of chai is very relaxing. On the street and by the water is not so relaxing. 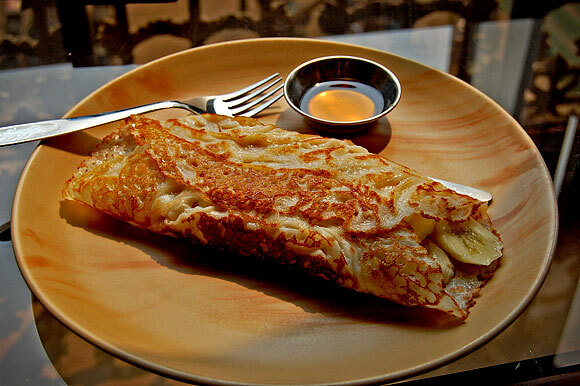 Our breakfast: the banana pancake. 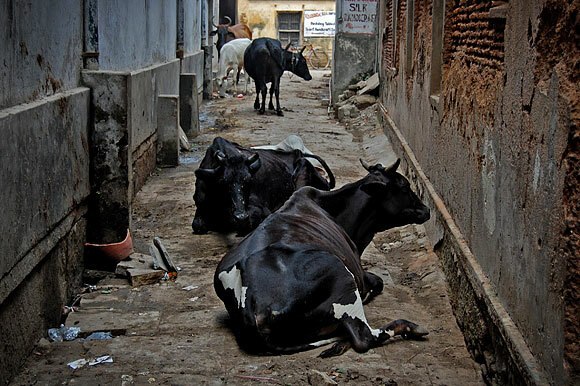 Cow alley leading to our guesthouse. 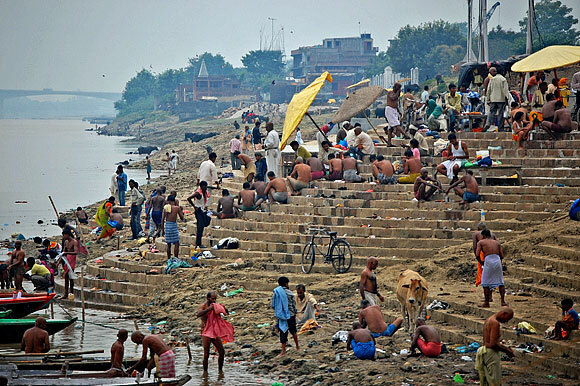 People on the Assi Ghat. 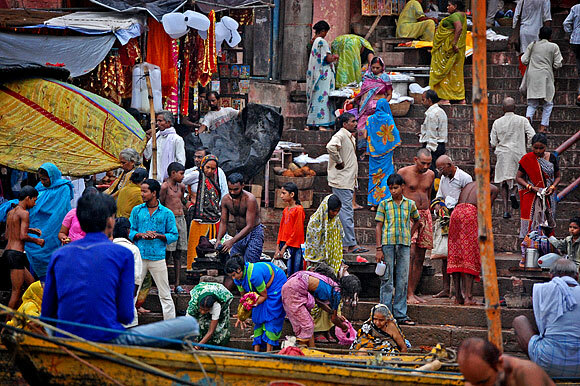 Varansi is one of the holiest places in India and claims to be one of the oldest living cities. Its history dates back to 1400 BC. 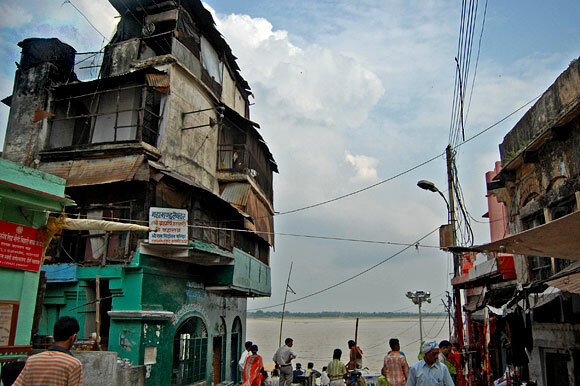 The place is filthy, decrepit but also full of humanity with its focal point being the numerous ghats that line the wide, brown Ganges river. The intimate rituals of public life are in full view on the water’s edge: prayer, pooping, eating, bathing, selling, sleeping, dying. It’s beautiful and annoying all at once. 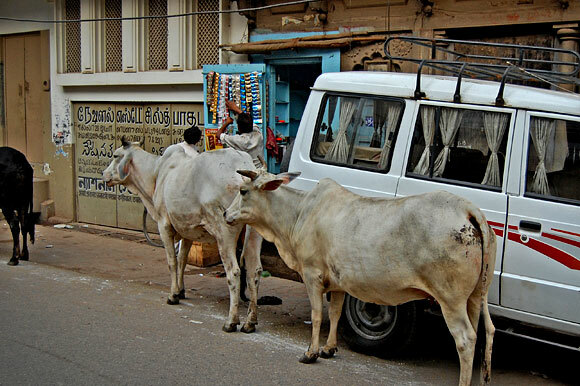 Cattle are everywhere, pooping in the streets, blocking traffic. 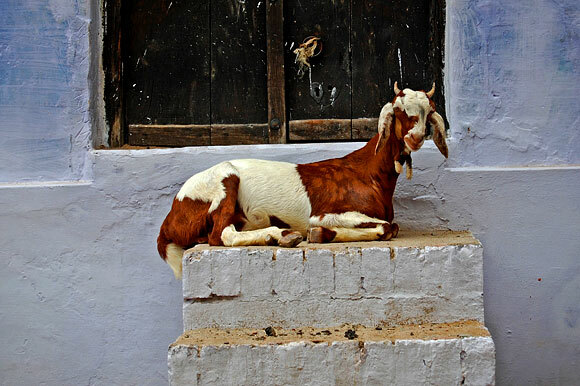 Goats too. There are some sick, sick looking dogs. 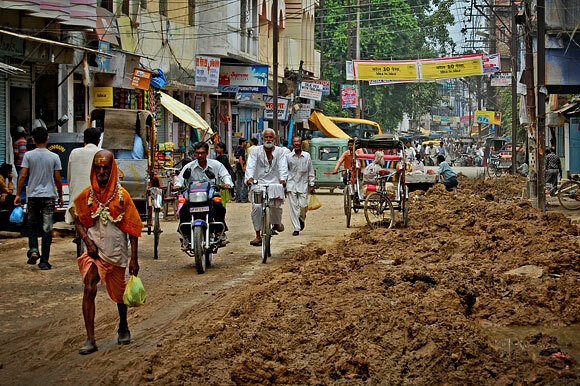 The streets are in shambles, the buildings are amazing and falling down, the power goes out, the sacred Ganges River is filthy, everything smells of pee. 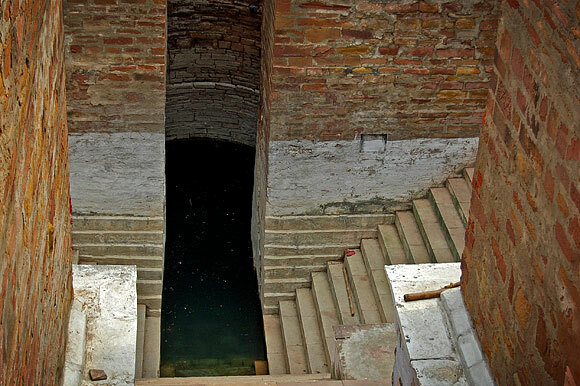 People drink the same brown water they wash clothes, bathe, and dispose of corpses. But none of that matters. What makes it exhausting to be outside is that everyone has some kind of offer. Walking down the street makes you feel like a walking ATM. You have to ignore people, even though they’ll tag along and try to get you to buy something or go somewhere or give them candy or whatever. It really makes you question manners and personal space. By the time one goes away, there is another to take his place. Beggar children are relentless. Sometimes I just want to scream or beat them with a cricket bat. But when you can find a quiet place and be around real people, the place is magical. People learning how to make incense balls. 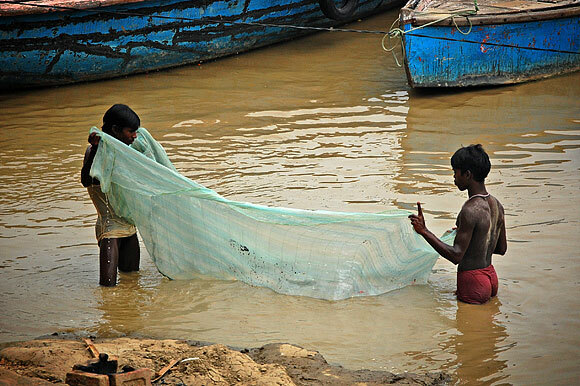 Two boys washing a sheet in the Ganges. 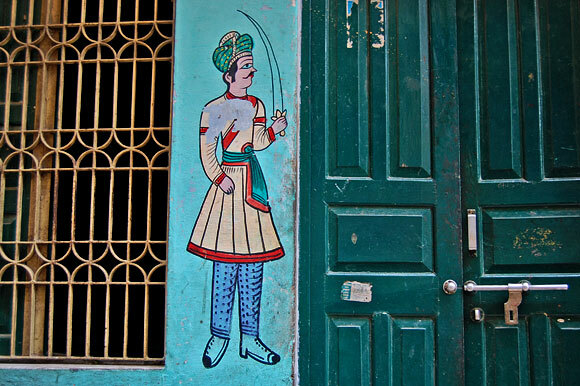 One of many great murals around the old city. 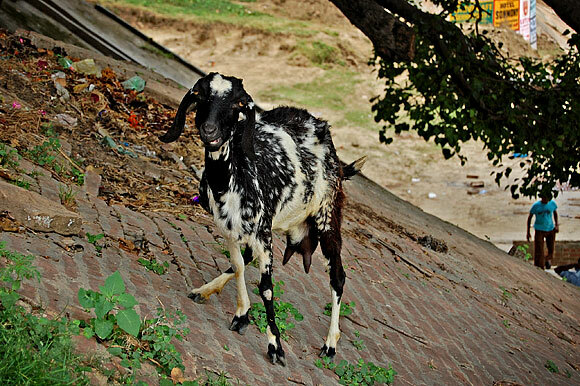 Despite all it’s hope it’s still just a goat on a slope. Enormous old well with supposedly holy water. 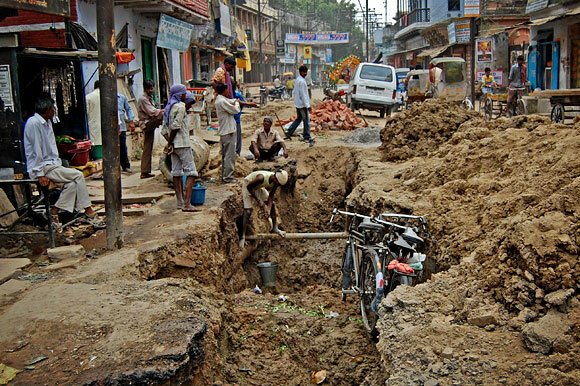 Shivala Road was a mess. 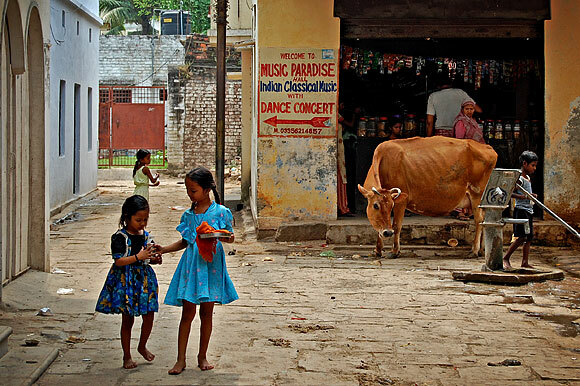 Kids and a bashful cow. 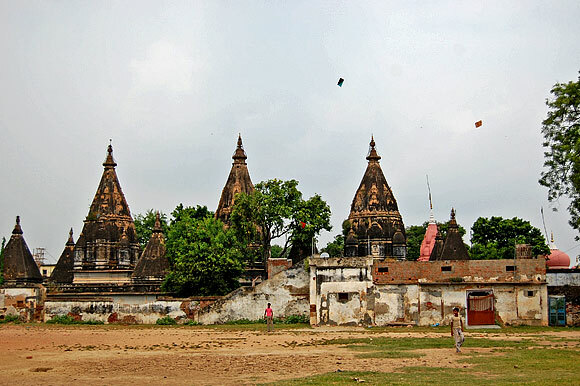 Old temple grounds with kids battling with kites and practicing cricket. Teen bats a tennis ball as a cow sniffs some clothes drying in the sun. 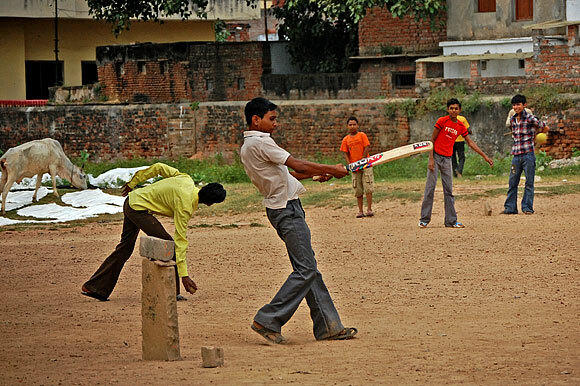 I got to bat once. 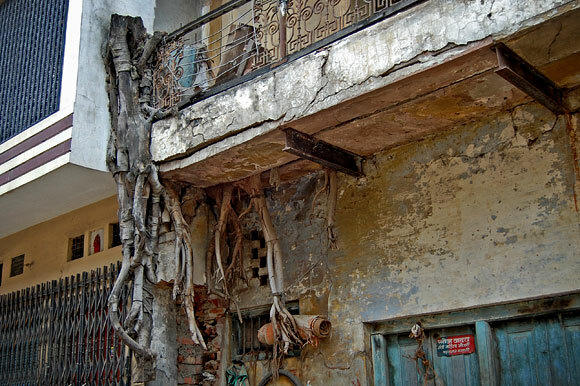 The remains of a tree that used to be growing on a building. 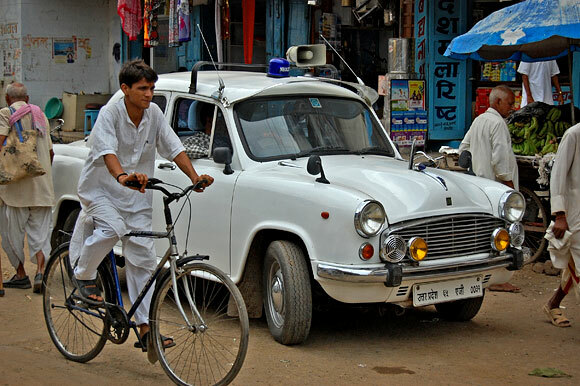 Old school police car, the same model as the taxi cabs. Lady, potatoes, and man at water pump. Two cows. Nearby where two more cows that had sat down in the middle of the road and created a traffic jam. 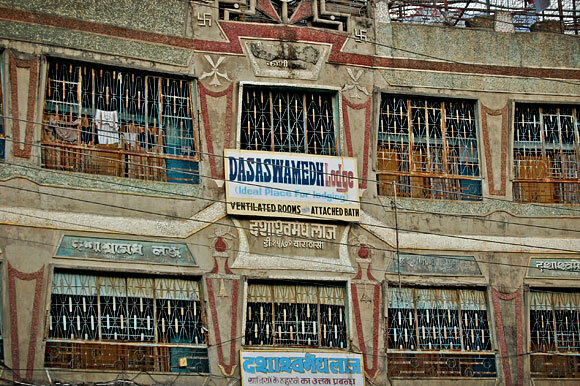 Colorful insanity along the Dasaswamedh Ghat Road. 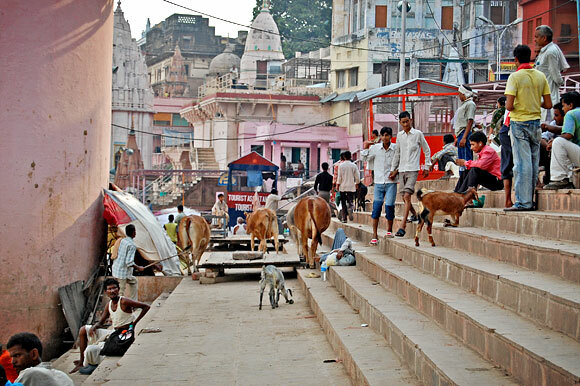 People and animals on the steps of Dasaswamedh. 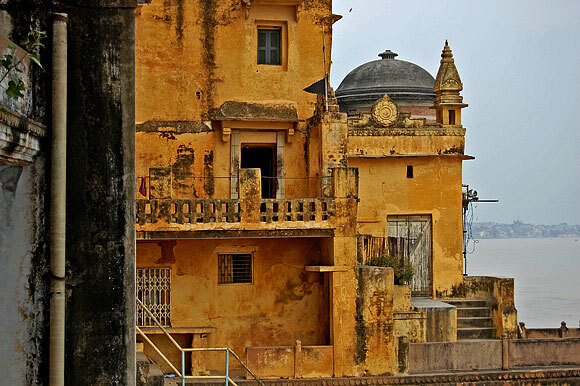 View NEW along the Ganges. Our first evening we had some decent India food at a rooftop restaurant near the guesthouse. A talkative student joined us and we discussed all things India and America. All sorts of weird bugs were drawn to the bare bulb lighting the table. For about 20 minutes, the power went out in the city. Apparently that happens all the time and any big business has a generator to keep the lights on. We parted company early and went home to sleep as we had arranged for an early morning boat ride. We slept well and woke at 4:45AM. The boatman’s brother was waiting for us. He led us to the boatmen. 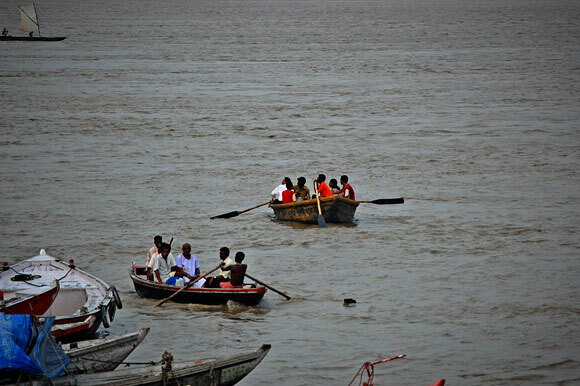 As sun broke through the drizzle, we drifted down the quiet water of the Ganges. 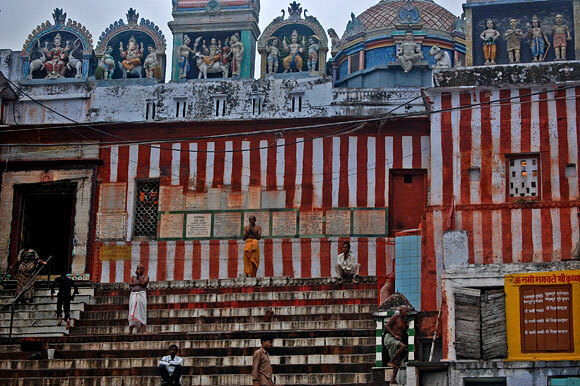 The Ghats at early morning. 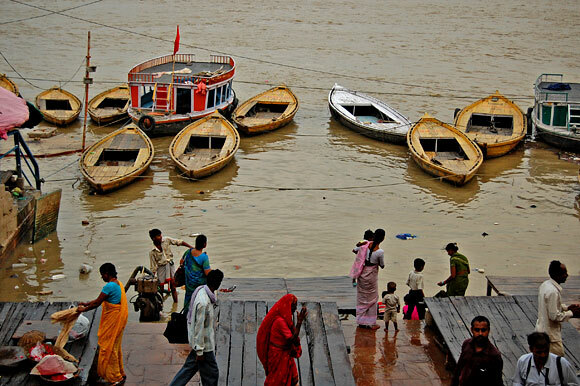 Our boat stopped at the main cremation ghat, Manikarnika. In this photo you can see the open fires of bodies getting cremated. We were given a tour by an intense, red toothed man who claimed to be in charge of the operation. I’m skeptical. His tour was informative, though high pressure for donations. He and an old lady seemed pissed by our donation amount, but we didn’t want to give them more. We did learn about the types of wood used (banyan on the cheap, sandalwood on the bling), different practices for bodies and burial. And we saw bodies burning. One particularly memorable sight was a pair of feet and a covered head sticking out of a burning pile of wood. It was sobering and visceral image of mortality. 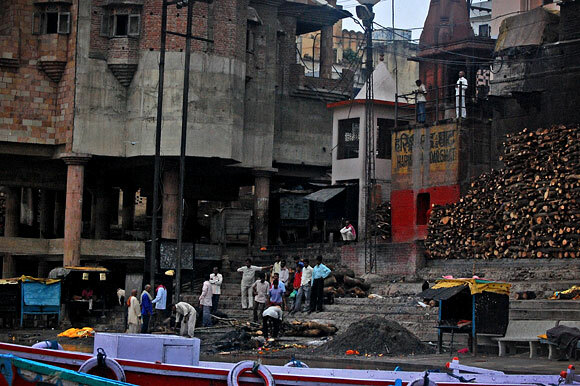 On the way back we saw the smaller Harischandra Cremation Ghat. There was a large, smokestack structure and piles of wood. 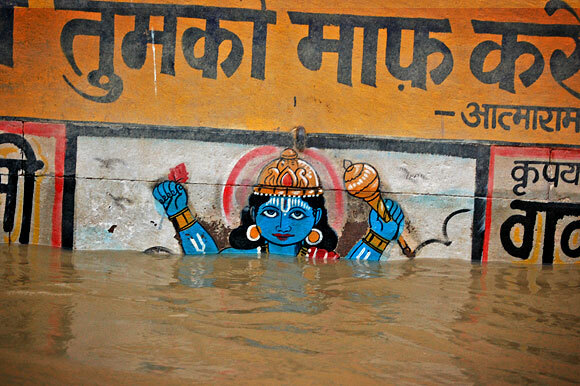 Ganges water levels are high, covering a lot of the ghats and their various sign-age. Two dogs in a tricky situation. You’re a man now, dog. 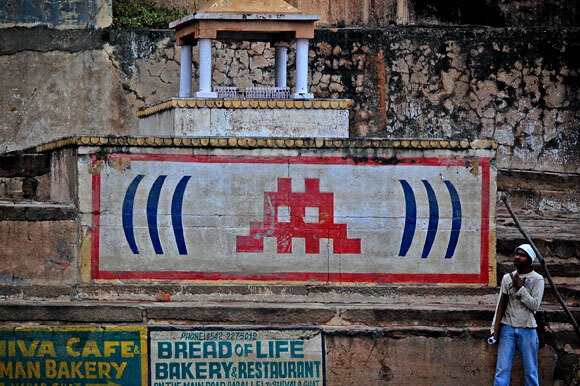 This space invader seems to be an unofficial logo for Varanasi. The boat trip cost us 300Rs($7) for two hours. We probably could have gotten it for less. There were three men taking turns rowing two-up to fight the current. 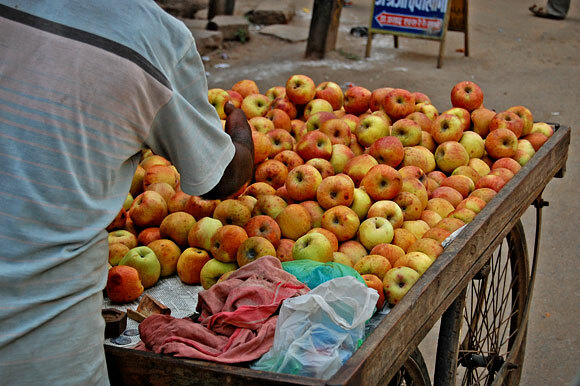 We tipped them an extra 100Rs to share. It was worth it. As the morning had been so eventful, the rest of the day was a relaxed wash. We got some cash and replaced our Lonely Planet India guidebook that I lost on the plane. We drank some tea and coffee and wandered around town a bit. 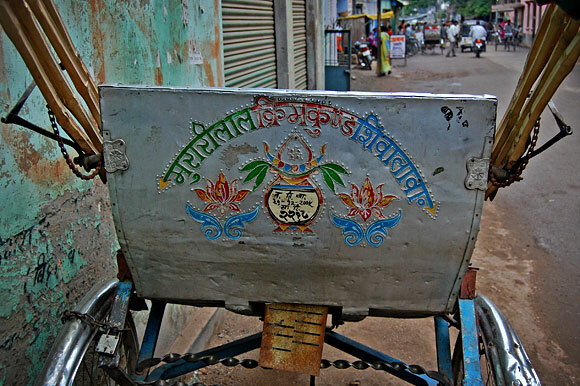 Decorative embossed and painted metal seat of a rickshaw. Manure palace. 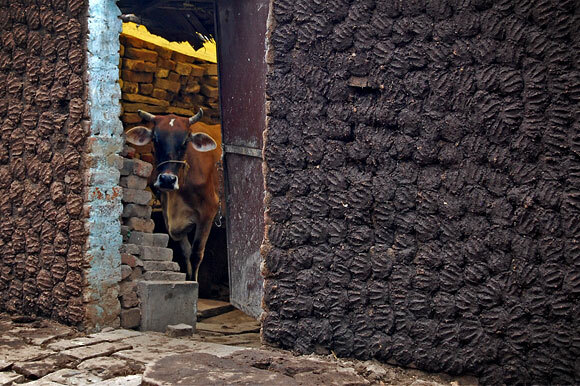 One of many walls coated with drying cow manure. 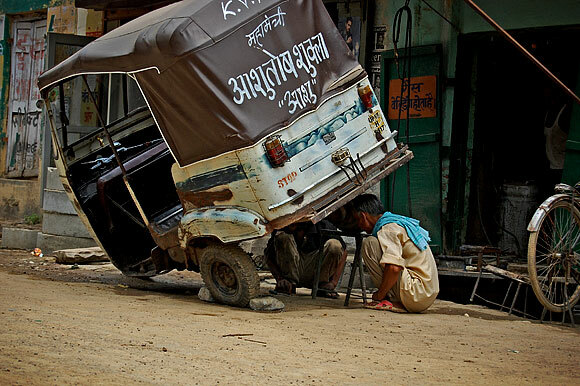 Kind of sums up Varanasi I think. 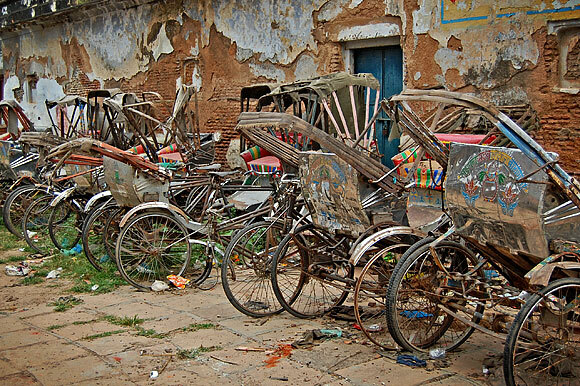 Tomorrow morning we leave for Agra by day train. I’m ready. Too many interesting images to comment on. Overall: Cool. And also, I’m suddenly grateful for my squeaky clean shower and paved roads. i remember feeling the same way about the touts. sometimes though, when you’re feeling lazy or its the middle of the night, they can be convenient. like riding a current. an expensive current. What beautiful pictures! 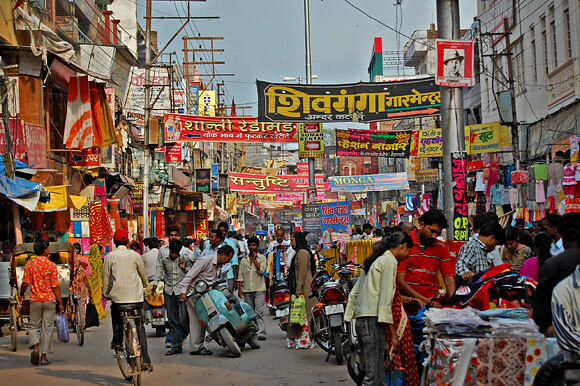 We are heading to Agra next week and possibly passing through Varanasi on the way to Kathmandu. Looks like an interesting place. Hi Cindi. 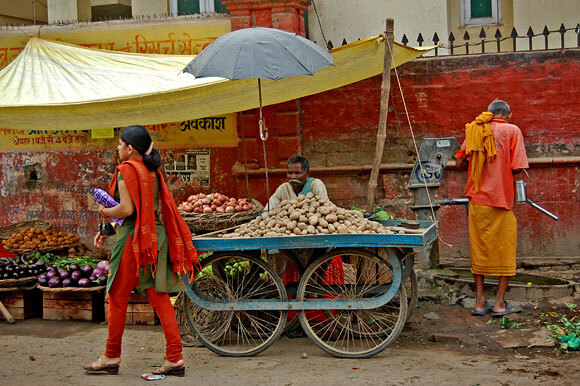 Varanasi, despite it’s hassles has a lot of interesting people watching. Just learn to ignore people. Safe travels. Great photos! Thanks for sharing. 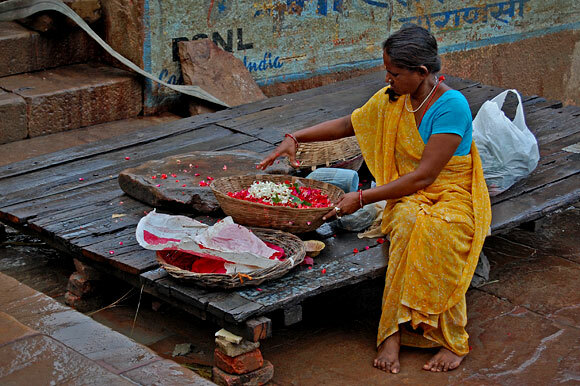 In the photo captioned, “People learning how to make incense balls”, what they are actually doing is performing Pinda Daan, or Pinda Puja. 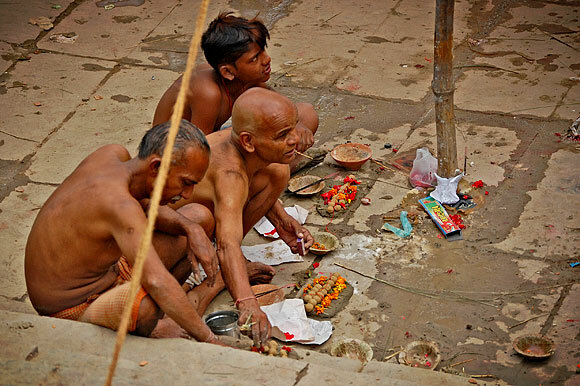 These are offerings made for the last rites of deceased ancestors, best done at Gaya but possible in Varanasi. And in your last pic, “Manure Palace”, the cow dung cakes will be taken down as soon as they are dried, then used as fuel for cooking fires. You must have seen the dust from these fires in the air at sunset time. Cheers! Thanks for the corrections and insight Joseph-ji. 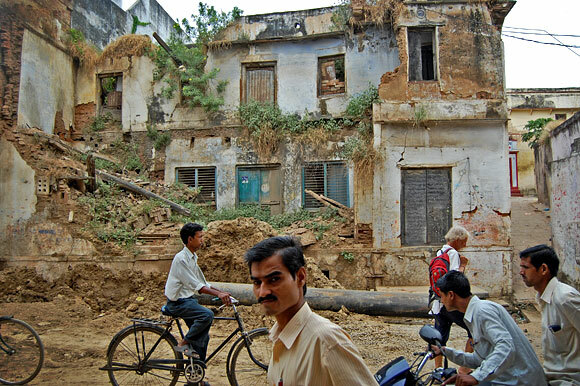 I lived in Varanasi for nearly 4 months. That city will remain indelibly marked in my heart forever. Great pics…thanks for the memories. 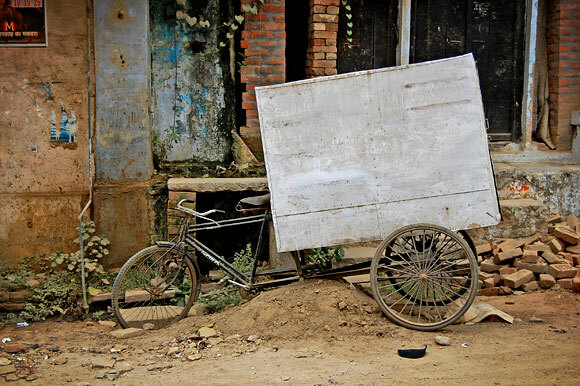 why only dirty photographs? 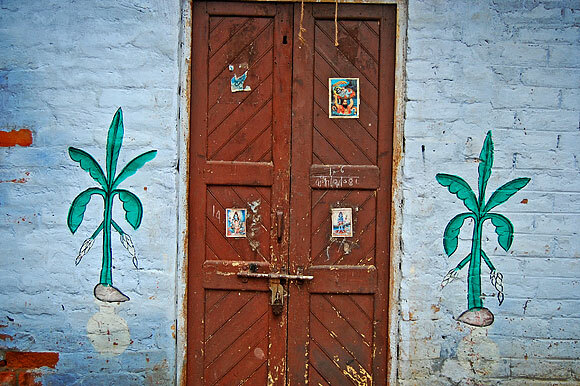 you could have taken nice temple photographs also Dont see the darker side of life.Be positive. Your above pics. 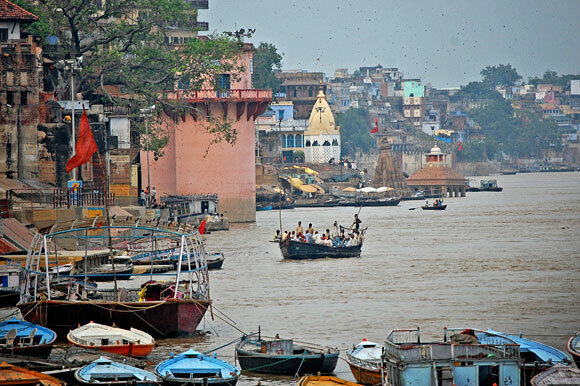 of varanasi are not at all appreciable. 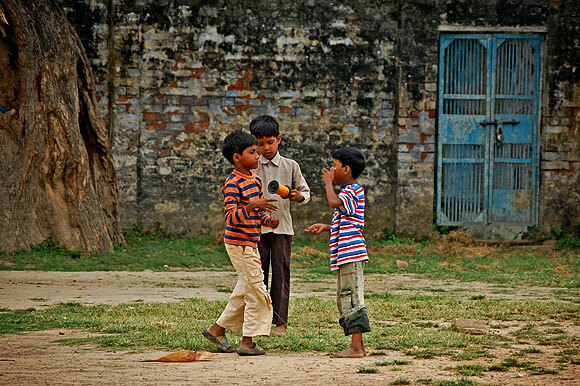 These are shown your involvement only with the materialistic world. 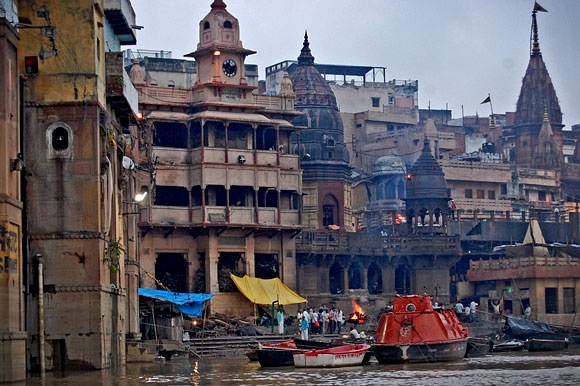 Suggestion: First change your heart & vision for eternal feelings,which Indians automatically feel when they visit holy varanasi. There is no greatness in clicking filthy pics. 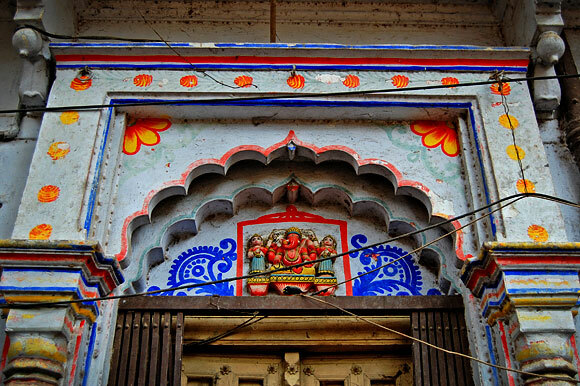 Anu, Varanasi was an amazing place. 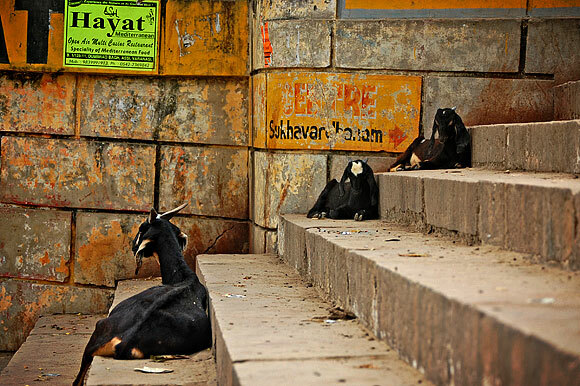 For me, the most fascinating thing was the feeling of the streets and the life along the ghats. I was more interested in this than the spiritual side. 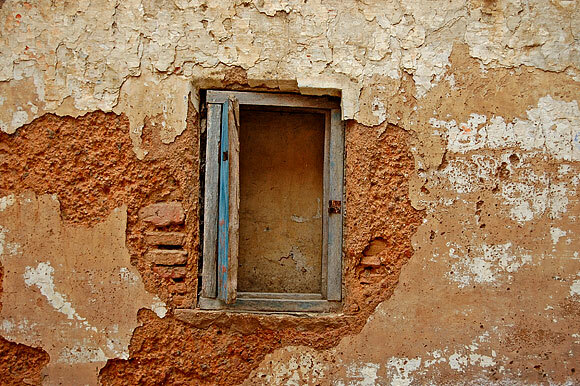 To me, it being dirty is not a judgement about the place, but you can’t deny that it exists or shouldn’t be noticed. It is beautiful in its own way. 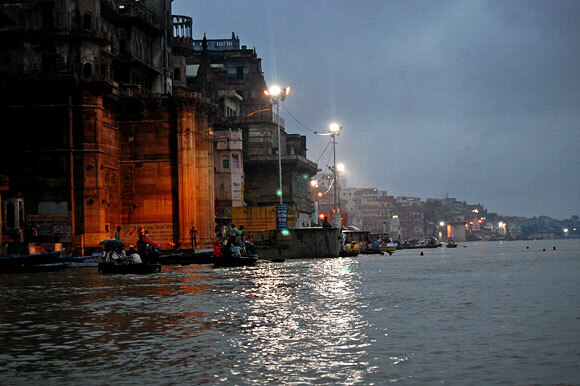 I find the filth of Varanasi beautiful, Radha. But that is my own personal taste. 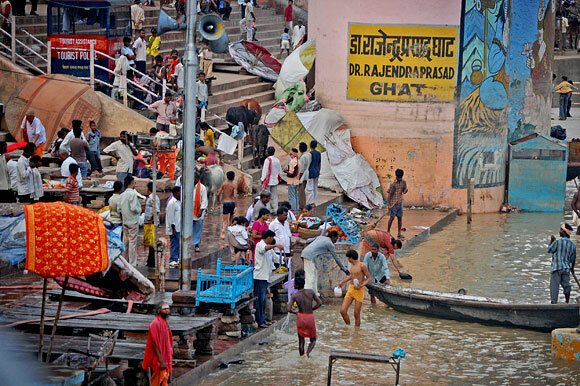 Radha, if u want to see true Varanasi pics, then see Geoff Gosson’s photostram specially the Nos. DSCF0488,0482,0483,0480 and the mesmerising pics No.0471 & 0470 The photographs are simply in good taste and so very beautiful and awesome. Its once again established that beauty lies in the eyes of beholder. You’re pictures are absolutely beautiful. 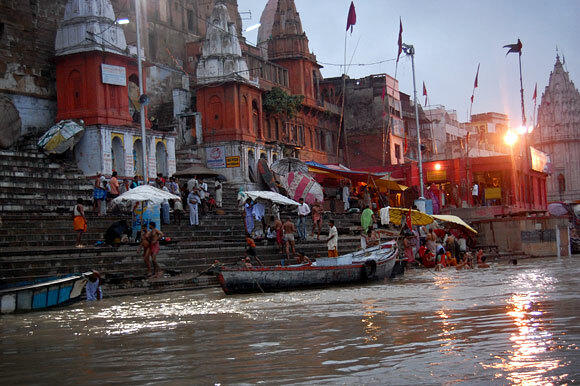 I have just booked flights to go back to India (this time on my own) and will definatly have to take a trip to Varanasi after seeing your blog.